So. I like wool. All wool. Scratchy wool, smooth wool, puffy wool, soft wool. wool. wool. wool. And I tend to collect wool a bit, especially when I find it at thrift stores and can’t not get it. Or when people give it to me. m snuggling the itchy scratchy. yep. he’s my child. Recently, I cleaned out the stash and gave away a TON to friends, who I even had to badger to come back for the second round of stash cleaning out. Somehow I managed to hold on to the stash of itchy scratchy yarn that I had been saving to make a rug out of. That’s right, I gave away much good serviceable next-to-the-skin wool, but I held on to the itchy and the scratchy. ahem. And right when I was thinking I might need to find someone else interested in making a rug, I received another bag of itchy scratchy yarn, got inspired and cast on. So voila! A rug was started. And I’m going to share the recipe now because I am having such a good time doing it. It’s no secret that I love anything that allows me to play with color that this one is exceptional, not only what color to put next to another, but also, the color mixes of holding several yarns together. Yarn: Whatever. 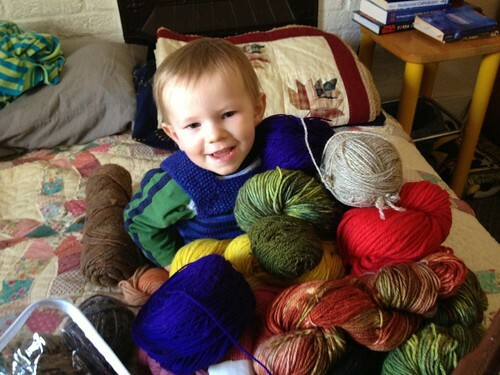 I recommend hard wearing yarn. Singles from hardy sheep breeds or vintage rug wool or plied yarns or yarns with mohair added. 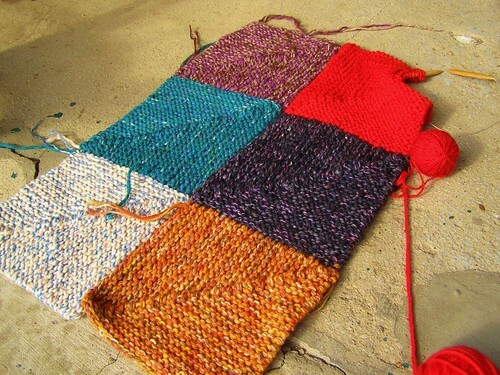 To create the correct thickness you will need to hold 3 worsted/aran yarns together, or one bulky and one worsted/aran. I’ve also done an almost bulky with a worsted/dk and a lighter weight yarn. Another whatever as long as you get gauge. I just play a bit until I find a combination I like and it seems about the same thickness as the other ones. I think this would be a great project for recycled sweater wool! More on how to do that in my book, if you’re interested. I’m doing solid squares, but this would be just as neat with one or two yarns held throughout and one or two that change half way through the square. 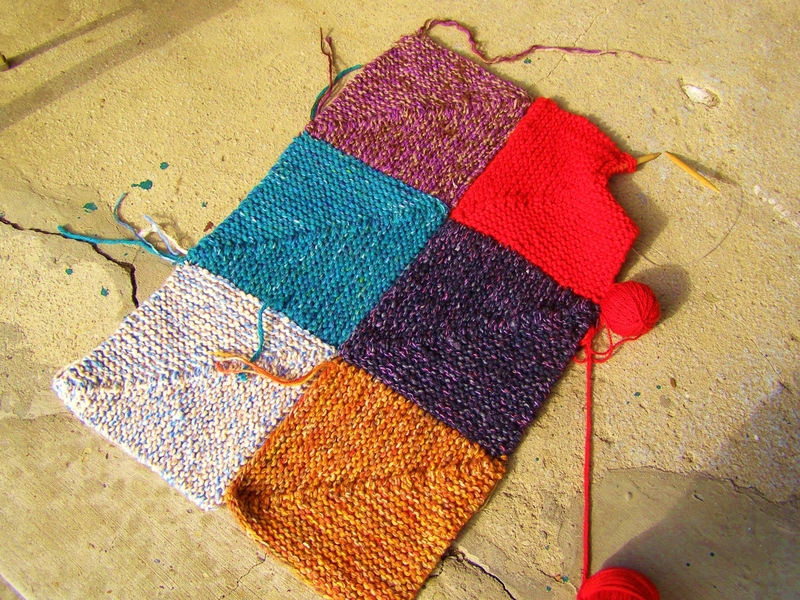 Notes: I’m making my rug in 3 square strips for several reasons. First, they’re still portable. Second, I plan to move at some point and might want my rug a different shape. This way I can take it apart and re-assemble as needed. I am 2 strips in right now and it seems a good size for a bathroom or kitchen rug if you want to make that. sl – slip one, as if to purl – in other words, simply move the stitch from your left needle to your right needle. RS – right side – where you do your decreases – the front of your work. If you don’t want to count the whole time, figure out a way to mark the decrease. I’ve been known to tie a spare scrap of contrasting yarn to the decrease pass over. The stitch that you pass over will be the center stitch of your next decrease. So you knit to one before that stitch, sl1, k2tog, psso. Do not pull yarn through. Leave the last stitch on the needle. With a new and exciting color pick up and knit across the top of the square 24 stitches (including last stitch of the previous square). 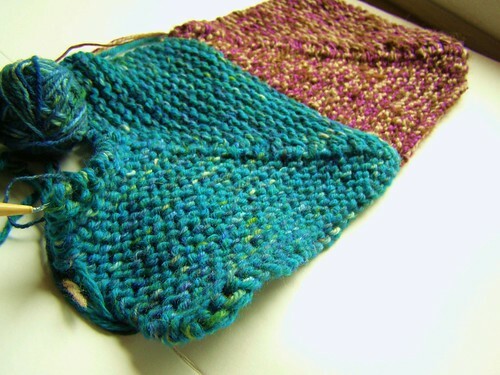 Using backward loop cast on, cast on 25 stitches to make 49. Work as you worked the first square. Repeat until your strip is as long as you’d like. When you’re done, arrange to your aesthetic sensibilities, thread a length of yarn onto a tapestry needle and seam by alternately picking up the edge of the garter ridges – the lower bump on one side to the higher bump on the other side. Tread upon, lay upon, roll upon, and admire your new rug. Also, if on wood floors put some of that don’t slip stuff down because wool is slippy on wood. On ravelry here. My project is here. m playing with the itchy scratchy. 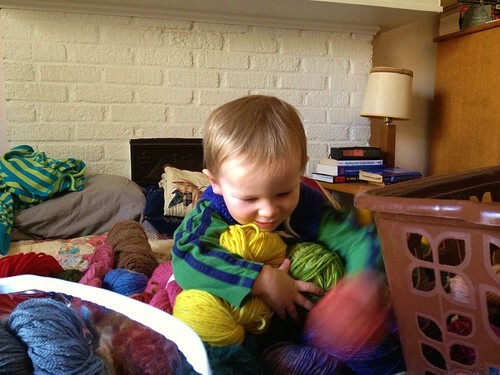 This entry was posted in cosyknitsliterally, knitting, patterns, rug by cosymakes. Bookmark the permalink. Nice, I’ve been looking at rug patterns as there don’t seem to be any decent bathroom rugs out there. Thanks a bunch…… I’m trying to go through my stash of wool and no amount of Christmas presents will put a damper on it, but three strands of woool for an entire rug….. now we’re talking!! And my kids need a warm rug for their play room. Got to go, got a rug to knit!